We are extremely grateful for the opportunity to take part in dream adventures such as flights over Mount McKinley, helicopter rides over the Juneau Ice Field and racing through the inside passage of the Tongass National Forest. But we also had the chance to learn about the history of America's most exciting state in Denali National Park. To Find out more about our other adventures, Check out Isabelles Travel Guide for our roundup. 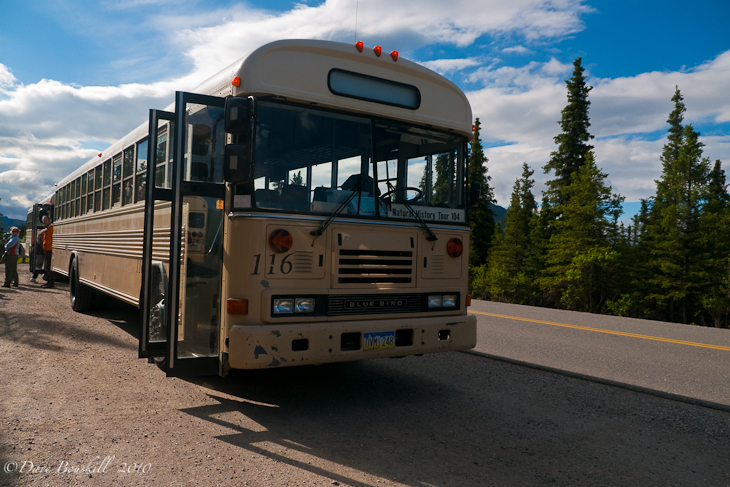 One of the most informative and interesting trips that we took was a bus ride through Denali National Park. It could have been one big yawn fest driving for four hours on a lonesome road somewhere in the middle of Alaska, but our bus driver Doug, was captivating and entertaining. 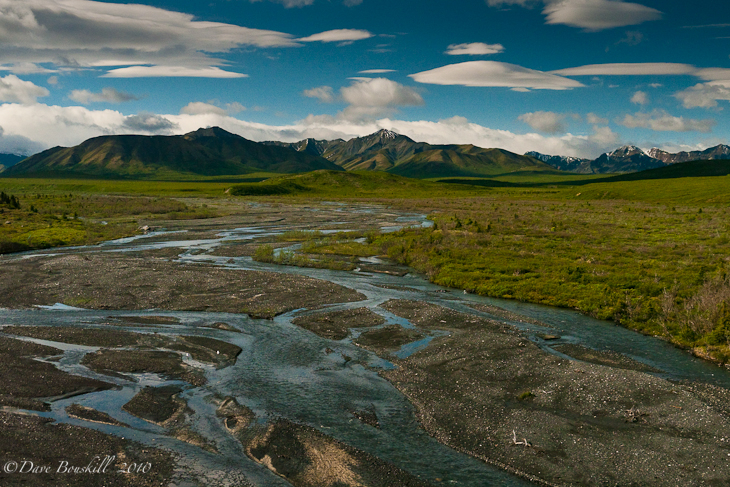 Founded in 1917 by a group of pioneers and visionaries concerned with over hunting of the native Dall Sheep, Denali National Park grew considerably over the years and now has an area of over six million acres. Denali is larger than the state of New Hampshire. Little has changed in almost a century. Park Rangers still patrol by dogsled, log cabins are still used as shelter and traffic is limited into the park with only one road leading in and one road leading out. We watched an excellent 18 minute film telling the story of Denali's roots and how it came to be. I found it entertaining and very interesting. I wasn't expecting to enjoy it so much, but this film is an excellent documentary. Private vehicles can venture into Denali National Park, but they are only allowed in as far as the 14 mile marker. The rest of the trip must be taken by bus, bicycle or on foot. It is an excellent way to keep human impact low on the park. We enjoyed learning about the plants of the area. I never thought I would be so enthralled with plants, but Doug's passion made me passionate. We held on to his every word as he explained what moss, tress and flowers could be used for medicinal purposes. You can make an entire salad out of weeds here in Denali – Blue Bell and Fireweed are completely edible. 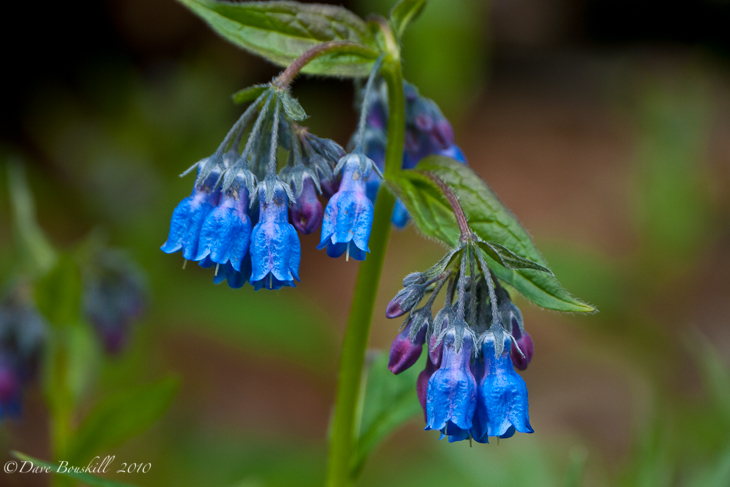 The Blue bell's are edible. Salad anyone? Try some Colts Foot in a tea to clear the lungs. Have some Valarien to relax. Did you cut yourself during a hike? Horse Lychan will clear that up. It is natures Neosporin. Just be sure to know what you are doing before you eat anything. 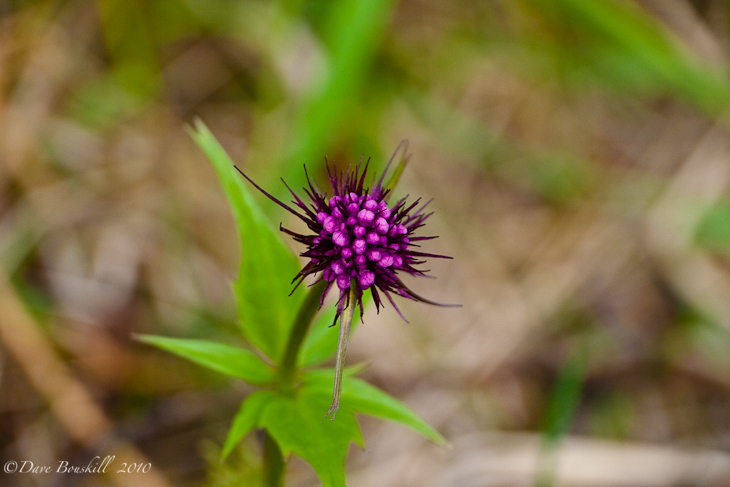 Some plants can be very poisonous. As we drove, we saw some wildlife in the distance. We spotted some Caribou and a few birds. I can understand why the wildlife doesn't frequent the area. It is the only road going through the park so they probably stay away. Liz from Travelogged ventured farther into the park the following day and saw more wildlife including bears. She suggests taking the 8 hour tour of Denali. The highlight of the day was definitely spotting the summit of Mount McKinley. 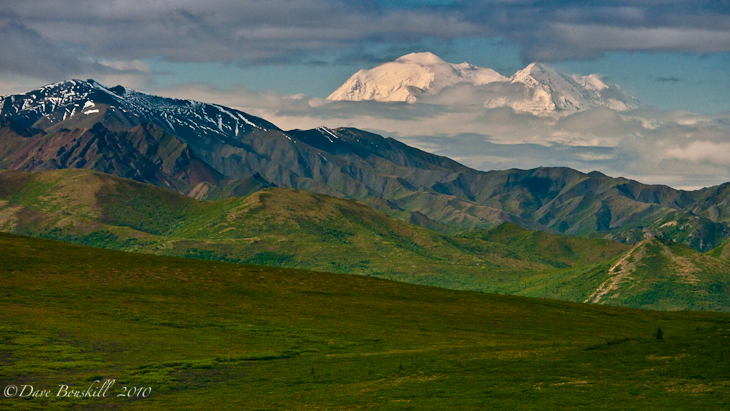 Known by its Athabaskan name in Alaska, Denali means the High One. At 6,194 metres (20,320 feet) it is North America's highest peak. It is shrouded in cloud most of the year, but we managed to capture a beautiful shot as it peaked out from the clouds. We didn't care for the staged performers that waited for us at checkpoints in the park, but we did thoroughly enjoy Doug's passion for the land and for the environment. Our least favorite moment of the day came when an Athabaskan Native guide talked about hunting bears in their dens during hibernation. I can completely understand why his ancestors took this right of passage; to feed their families during the long cold winters. But to hunt a sleeping, helpless bear in cold blood in today's day and age when food is readily available is something that I can never understand. It was during our drive home that I started to listen to our driver Doug speak as I was dozing off. His words gently took me out of my daze as he talked calmly about preservation and conservation. It was an interesting contrast to hear Doug's point of view compared to the other guide. Something I respect about the National Park and Princess Cruises for, they give both sides of the story for the passenger to decide who they agree with. 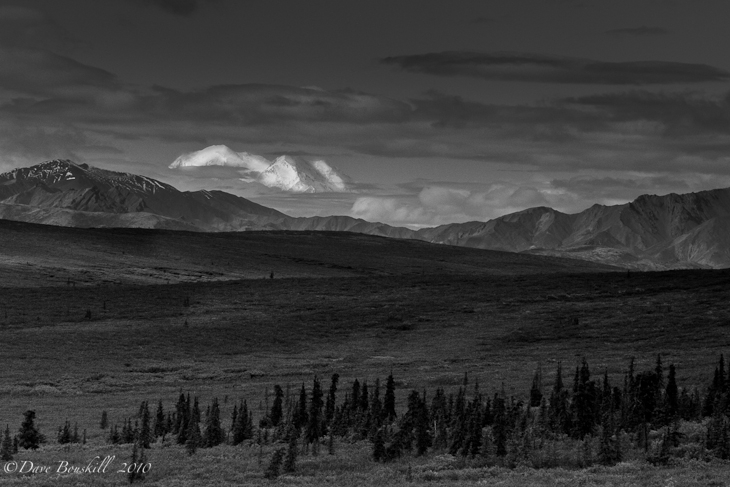 Denali National Park is still wilderness. We should never forget that. When trekking into nature, we have to remember that we are the visitors. 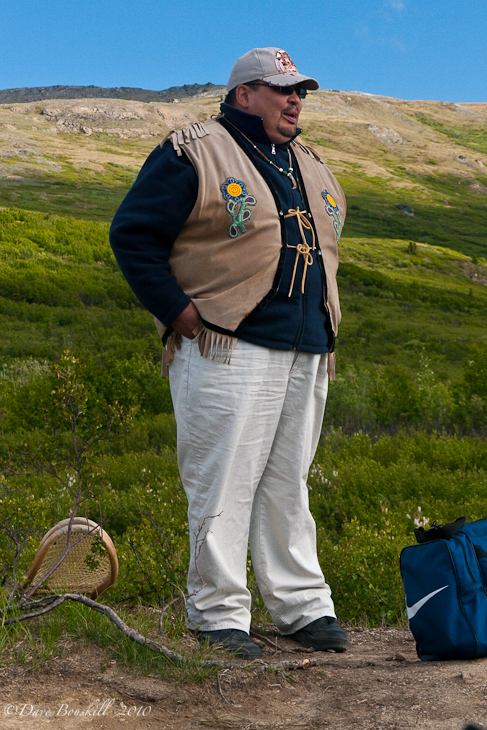 We must learn how to be careful when hiking out into the wild Alaskan Wilderness. Make a lot of noise, hang your food away from your tent, don't keep food in your tent and know what to do when you spot wildlife such as a bear. Up until last year there hadn't been an attack by a Grizzley for 93 years. Humans and nature have co-extisted beautifully here. But that all changed with new gun legislation. For some crazy reason the government has allowed tourists to carry guns into the National Park to protect themselves. Now instead of taking the proper precautions, people are feeling over confident and just last year a Grizzly Bear was shot and killed. For our part, we will continue to enjoy our national parks here and Canada around the world gun free. There is nothing more fulfilling than enjoying nature up close and personal and we look forward to coming back to Alaska and spending several days in this untouched and magnificent park. 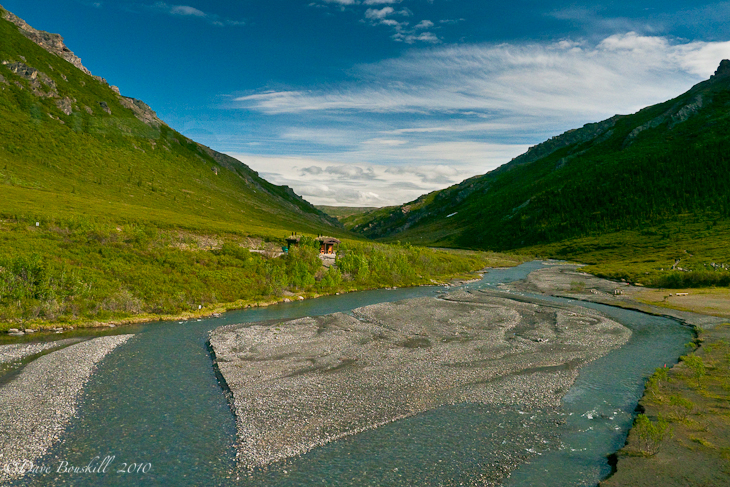 While the tour was interesting and informative, there is nothing better than stepping out of the tour bus and getting out from behind the glass and actually exploring a great park like Denali on foot. We can't wait to come back to Alaska. 22 Responses to "Alaska’s Denali National Park, Pioneer in Conservation"
It makes me sick to my stomach when I hear of someone shooting a grizzly bear because they made a mistake and put themselves in danger. These idiots that come out here toting guns and taking immense risks with the wild life that they would never normally do, with say, just pepper spray. I go fishing up in Yakitat every Fall and at least there you’ll get slapped with a massive $25k fine for killing a griz. Plus you gotta haul it out yourself and arrange for it to be skinned, etc. great pics! I’ve always wanted to go here, it looks so beautiful! Nice pictures you took while visiting Denali. Thanks for sharing. .-= Coolmon´s last blog ..Nevis Island – West Indies =-. I took my bus ride through the park today. Rained all day though so not as many animals and no Mount McKinley. Consider yourself lucky! .-= Brian Setzer´s last blog ..The Kroschel Film Wildlife Center =-. Dave’s photos never cease to amaze me. Absolutely stunning. Alaska is a state I’m determined to see in the coming years. .-= Matt´s last blog ..Reaching 25 Countries By the Age of 25- Experiences Along The Way Part 1 =-. .-= Sonya´s last blog ..Coral Volunteer Vacations =-. Aw, thank you so much! That is one of the nicest things anyone has ever said to us. Wow, fantastic photography. Glad you got some decent weather to see the mountain. Terrific photography guys… really good pics in low light conditions. I haven’t made it to Alska, but hope to do so someday and get a chance to see the Kodiak bear. Did you ever see one? Wow, I really enjoyed this post! And your photography here is absolutely awesome! well done! .-= Brendan van Son´s last blog ..Pious Torture- The Spanish Inquisition in the Americas =-. Love your Alaska photos. I have been fortunate to travel often to Alaska. My last trip was to cover the 2010 Iditarod Sled Dog Race. If you have a chance to return to Alaska, I have quite a few “Things to See and Do” about Anchorage, Fairbanks, Ketchikan, Juneau if you are interested on my What a Trip blog. .-= Nancy D. Brown´s last blog ..Best Things to See and Do in Ghent- Belgium =-. Thanks Nancy! We are definitely going to go back to Alaska, when we do, I will check out your blog! Too cool that you covered the Iditarod. We met Lance Mackey and Jeff King on this trip. Very cool! Very interesting post! Personally I don’t believe that people have any business traipsing about the wilderness UNLESS they have enough experience and intelligence to know how to avoid confrontations with bears or other potentially dangerous wildlife, but I do think having a gun – strictly for self-defense – is smart. Even though bears do not hunt humans, or attack without provocation, there are other wild animals that do. And as usual, stunning photos! .-= Trisha´s last blog ..Q&A- How to Incorporate a Newsletter =-. Well put. It is true, too many “weekend warriors” are going out into the wilderness alone without any knowledge on how to avoid dangerous situations. Knowledge and respect is the key. The picture of Mount McKinley is incredible! I would love to eat that herbal fresh salad right off the plants. I’ll be careful to not choose the poisonous ones! .-= Migration Mark´s last blog ..Food that Overflows onto the Sidewalk in Yaowarat =-. Yes, it definitely helped to have the guide there to be sure to eat the right stuff. We tried some spruce buds too and they were delicious! Wow, these photos are gorgeous! We will definitely need to put Alaska higher up on our wish list now. Sounds like a fantastic trip. .-= Audrey´s last blog ..Panorama Friday- Market Day and Banana Peels in Yunnan- China =-. It really was a wonderful trip. We can’t wait to go back to Alaska and spend some serious time there really taking in the atmosphere. Just writing about Into the Wild makes it lovely to see this post! It looks absolutely breath taking! Alaska should definitely be the adventure state!